1. Begin with a list of places you’ve been (or are familiar with) that are memorable and particularly colorful (three minutes). Write for 20 minutes, anything that comes to mind. I’m staring into the tiny face of a lavender blossom: little violet stars magnified by reading glasses. I know the whole world is in love with flowers, but I feel like they are my lifelong companions. 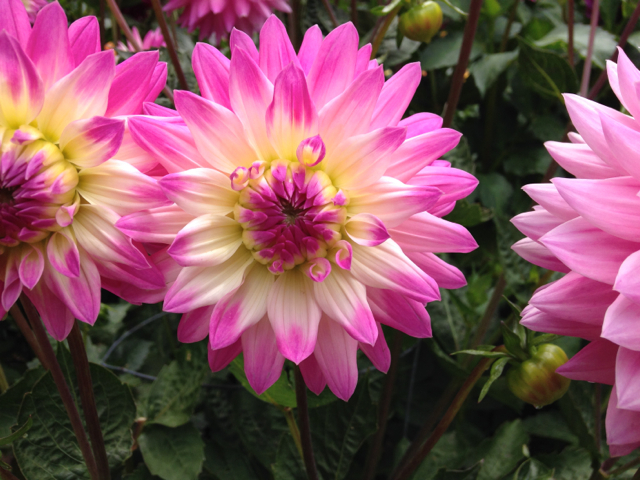 Wasn’t it I who made a special trip every September to Golden Gate Park to visit the dahlias? My eyes would drift past the gates into the forest of bright galaxies and suns. And what about that year in late April when I gave myself Chicago for a birthday present? The tulips and jonquils along Michigan Avenue surrounded every tree for a perfect mile: purple, yellow, bright orange. I saw the Jardin du Luxembourg in May, when the marigolds glowed like miniature suns in great clusters near the pond, and the cherry trees burst forth pink blossoms: comets shooting up and out of the dark branches. Even yesterday, in Oakland, when I confused Valley Vista Avenue with Grand Vista Avenue and had to backtrack to find my car, even then, frustrated, hot, I found my way again past the wall of star jasmine, inhaled deeply, and said thank you. I don’t need to visit a florist or find my way to a field of mustard flowers or orange poppies bobbing in the wind, because I’m sitting in the center of a garden wherever I am. Wherever I am, I’ll seek out the flowers. I’ll wander under the canopy of pink, pink Japanese cherry trees. I’ll stop in front of the rose bushes on Tiburon Street on my way from one class to another and press my face into the white and raspberry folds curling out like some fabulous nebula, the center sweet as ripe berries. Even the strawberry blossoms make me feel at home with their dumb, bright centers that grow green, then red. I’ve grown beyond the days of hollyhocks and geraniums. Grown beyond the mother who taught me their names, who plucked violets and gathered them in glasses of water along the window ledge. It’s been thirty-four years since I discovered lilacs on Lilac Boulevard, or orange roses in my neighbor’s backyard. Now I place myself squarely in the center of this world of flowers, this universe I belong to, this place I call home.